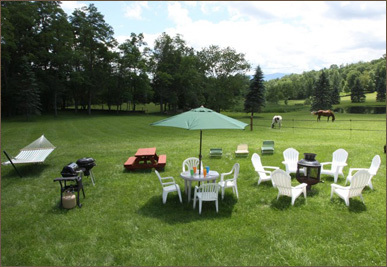 We spent one week at the Carriage House and had a wonderful experience. The scenery is incredible, so tranquil and beautiful, the house is in great condition supplied with everything one may need while away from home. You will not find a host like Liz very often, her hospitality and willingness to help make our stay the best was really commendable she really puts a lot of effort in making sure her guests leave with a WOW feeling. And that's how we left. Not to mention the thrill our 2 and a half year old baby had while taking pictures on the beautiful and well trained horses, feeding them carrots straight from his hands, watching the deer come and eat right next to us, watching the turkeys and the geese peacefully coming to Liz's calls for feed. And should not forget the boat and the pond which were so much fun to take our son on. We highly recommend this place, you will not be disappointed.